Prior to returning to Harvard, Lessig was a professor of law at Stanford Law School (where he was founder of Stanford's Center for Internet and Society), Harvard Law School (1997-2000), and the University of Chicago Law School. Lessig clerked for Judge Richard Posner on the 7th Circuit Court of Appeals and Justice Antonin Scalia on the United States Supreme Court. For much of his academic career, Lessig has focused on law and technology, especially as it affects copyright. He is the author of five books on the subject—Remix (2008), Code v2 (2007), Free Culture (2004), The Future of Ideas (2001) and Code and Other Laws of Cyberspace (1999)—and has served as lead counsel in a number of important cases marking the boundaries of copyright law in a digital age, including Eldred v. Ashcroft, a challenge to the 1998 Sonny Bono Copyright Term Extension Act, and Golan v. Holder. His current academic work addresses the question of "institutional corruption"—roughly, influences within an economy of influence that weaken the effectiveness of an institution, or weaken public trust. His current work at the EJ Safra Lab oversees a five-year research project addressing institutional corruption in a number of institutional contexts. 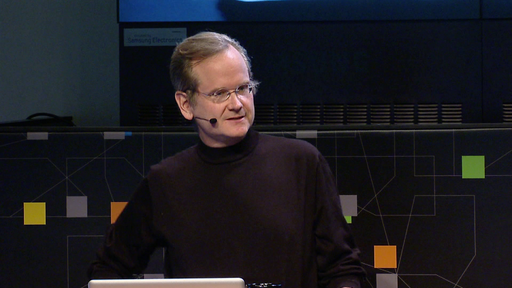 Lessig has won numerous awards, including the Free Software Foundation's Freedom Award, and was named one of Scientific American's Top 50 Visionaries. He is a member of the American Academy of Arts and Sciences, and the American Philosophical Society.